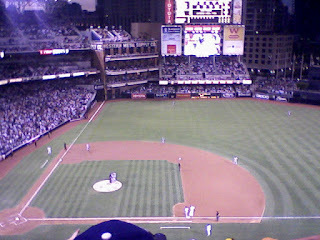 A couple of nights ago, I got to go to the Padres game against the L.A. Dodgers (always a fun rivalry). It was the padres "faith night," so we took the youth group. I wasn't sure what to expect but all I knew was that after the game a few Padres and Dodgers were going to come out and share their story of faith (they were all christians). to be honest, I expected a somewhat lame experience followed by an alter call but what I got was actually a very cool experience. The Padres who talked all came accross very humbly and honestly--I was quite impressed. The catcher, Josh Bard, was my personal favorite. He talked about how he grew up thinking it was just about either believing or not believing but through lifes twists and turns he discovered that it's not so simple and it's more about following than believing. Those were a few among some good thoughts that were shared. For the most part I was pleasently suprised by the thoughts that were shared. But it definatly was something only Christians could have really appreciated. I think part of their intent was to have some "non-Christians" there so they could evangelize but I don't think it would have been very effective for that. As it's always been, evangelism still happens in real relationships, not through a bunch of rich baseball players. Faith night was a good experience and... by the way... the Padres won 6-3!